Web GIS is a pattern for delivering GIS capabilities. It is at the center of Esri’s strategic direction for implementing GIS as a platform. The key concept behind web GIS is that all members of an organization can easily access and use geographic information within a collaborative environment. Analysts still provide technical GIS expertise in the traditional sense, but other staff in the organization with little or no GIS knowledge can also benefit from and contribute to the organization’s GIS platform. Web GIS leverages existing GIS investments and makes them discoverable and more accessible. It provides a platform for integrating GIS with other business systems and promotes cross-organizational collaboration. Consequently, web GIS extends the reach of GIS to everyone in an organization, enabling better decision making. Although there are two separate web GIS deployment models, hybrid deployments that combine parts of the cloud-based model with parts of the on-premises model are not only possible but very popular. These two common hybrid deployments are: ArcGIS Online + ArcGIS for Server + ArcGIS Online content and Portal for ArcGIS + ArcGIS for Server + ArcGIS Online content. Selecting the appropriate web GIS deployment model—SaaS, on-premises, or a hybrid variation—will depend on an organization’s business workflows and security requirements. Organizations can use one or several deployment models of the ArcGIS platform to enable web GIS to support their different lines of business. Portal for ArcGIS is a mapcentric content management system that an organization can host within its own infrastructure. Portal can be deployed on Windows or Linux operating systems and installed on an organization’s physical machines or in the cloud. It is software that enables an organization to deploy the portal concept of the web GIS pattern. An organization that installs Portal for ArcGIS would typically already be using ArcGIS for Server as part of its GIS operations and is responsible for the setup, configuration, and management of the portal. 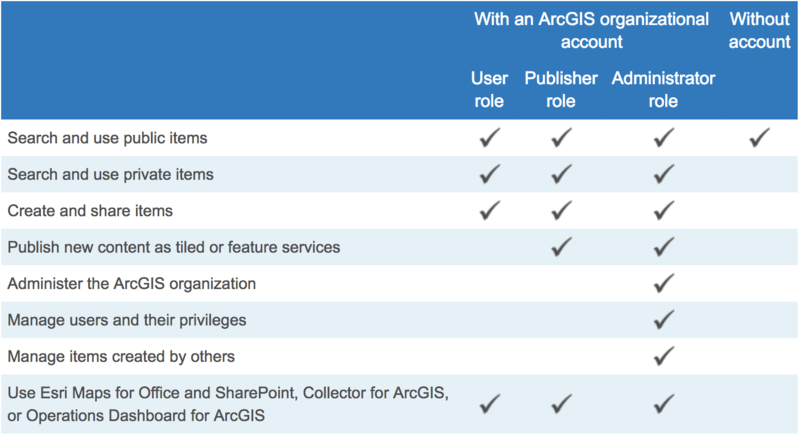 There are several reasons why an organization chooses to implement Portal for ArcGIS instead of using ArcGIS Online for its web GIS portal. An organization may have sensitive data that cannot be uploaded and stored in the cloud. 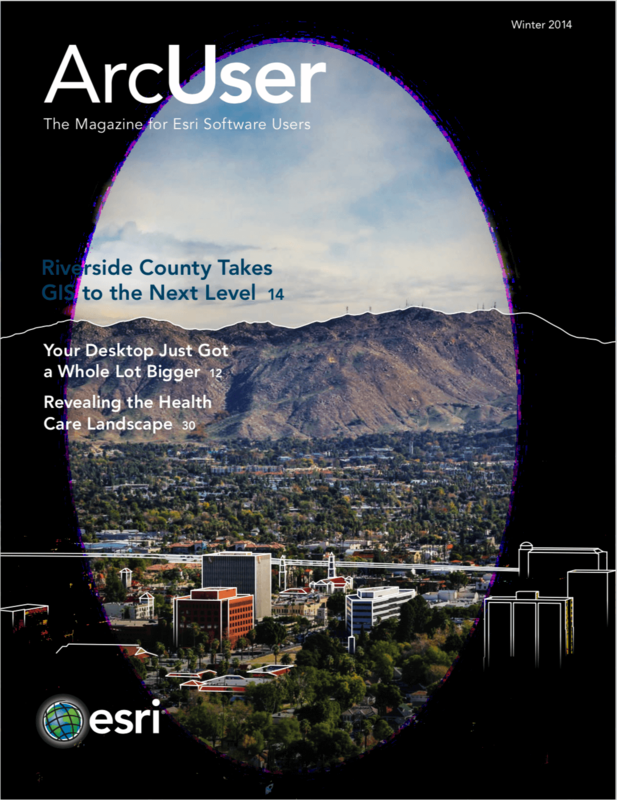 Perhaps the organization has unique security constraints and IT policies that can only be addressed by running the ArcGIS platform within the organization’s IT infrastructure. There may be requirements to honor strict service-level agreements that cannot be currently met with ArcGIS Online. The organization may work in an isolated/disconnected network environment that does not have Internet access. While Portal for ArcGIS offers many capabilities available in ArcGIS Online, some functionality may not yet be available because its development and release schedule follows that of ArcGIS Online. When a web service, web application, or data file is registered or created in Portal for ArcGIS, it becomes a Portal item. An item defines a unique searchable element in the portal that has descriptive information associated with it and must be tagged with keyword(s). Depending on the type of GIS content added, in some instances, the GIS resource is simply being referenced and not physically moved into Portal. For example, items could be referenced to an online resource such as a web service or web application, or they can contain actual data such as a tile package or PDF document. Portal for ArcGIS can aggregate all of an organization’s GIS assets and related data files into a central location. It is a content management system for GIS resources that is easily searchable and accessible through the user-friendly Portal website. 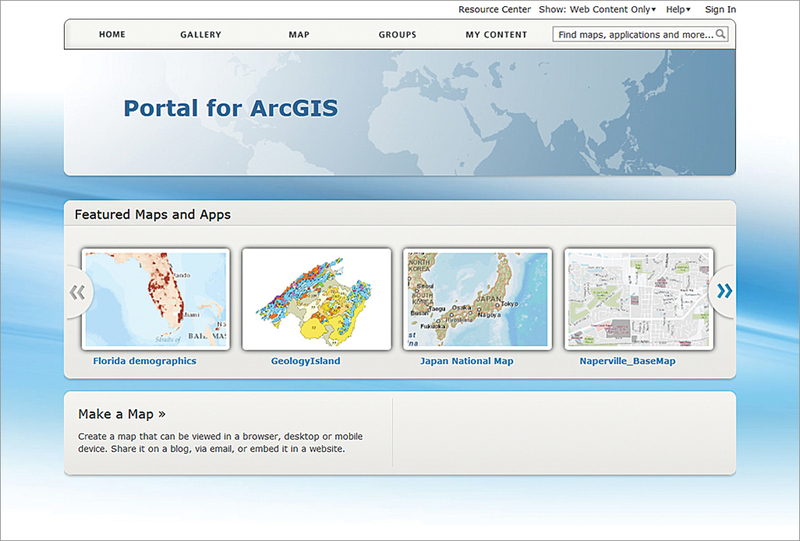 A key aspect of the Portal for ArcGIS website is the map viewer. It provides an interactive means to perform mapping and visualization of GIS data. A user first selects a basemap, then searches for GIS content (typically web services) and adds them as operational layers (i.e., business information) onto the basemap. Optionally, the display properties of the operational layers can be configured such as setting transparency and symbology and activating and customizing pop-ups and attribute tables. 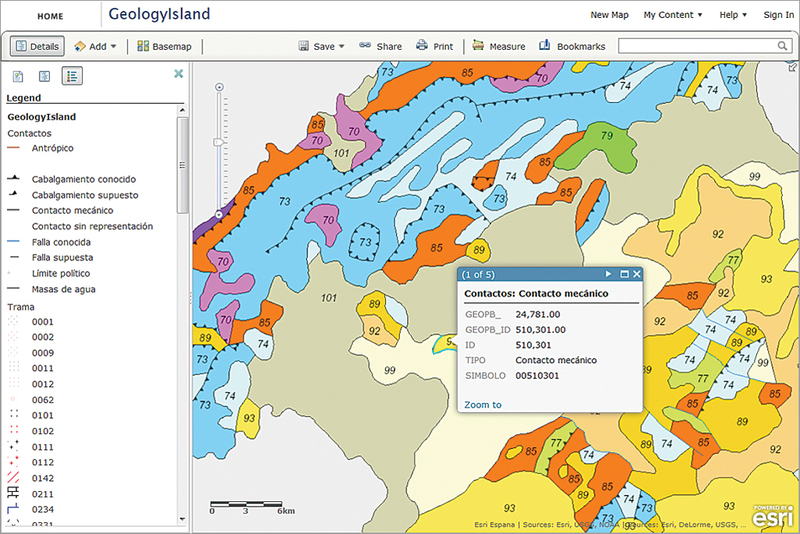 Users can also add and display their own data, such as CSV, TXT, and shapefiles, on the map. The map viewer offers a simple and user-friendly mapping experience that makes it easy to find, assemble, and create map information products. It empowers those without GIS expertise to leverage GIS technology with their organization’s GIS assets in a very accessible manner that extends GIS technology to a broader user base. For example, a member named Bob creates a new web map in the map viewer, saves it, and shares it, making it available to other Portal members. Anne, a coworker, can open Bob’s web map in the map viewer and use it as a starting point for her own mapping visualization. She may add or modify the map contents, save it as a new web map, and share it with other members. Anne leverages Bob’s work, and they have both extended the organization’s GIS content by contributing back their data and analysis. 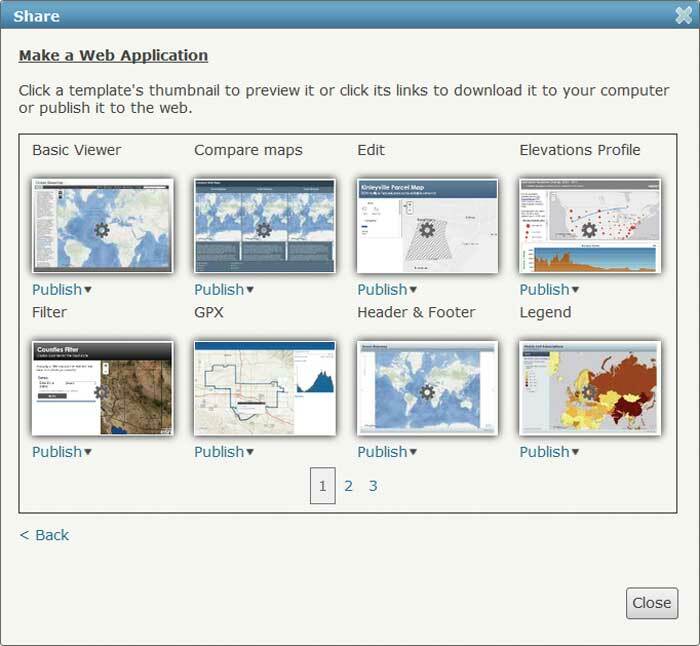 Portal for ArcGIS members can also build web applications for their web maps using the application templates included with Portal. With these templates, members can create and deploy new web mapping applications for a web map without any programming. Once a web map is saved and shared, a Portal member can select an application template, and the map’s data content populates the template to create a new web application. The web application can be hosted within Portal for ArcGIS, or its code can be downloaded onto a local machine and then hosted on an organization’s web server. Portal for ArcGIS includes many different application templates, and some can be further configured and customized. Each template is designed for a specific use case such as telling a story or answering questions. Portal for ArcGIS, an optional extension included with the ArcGIS for Server Advanced edition (Workgroup and Enterprise levels), is a different and separate installation from ArcGIS for Server. It requires installation of the ArcGIS Web Adaptor, which is included with ArcGIS for Server. The Web Adaptor integrates Portal with an organization’s web server architecture, enabling Portal to use an organization’s identity store and security policies at the web-tier level. Portal for ArcGIS includes its own identity store but also supports both Integrated Windows Authentication (IWA) and Public Key Infrastructure (PKI) authentication for logging into the Portal website and accessing its content. Portal for ArcGIS and ArcGIS for Server can be installed on the same machine or on separate machines. Portal for ArcGIS administrators can customize and configure many different properties of the Portal website and determine the functionality available. They can change the look and feel of the website home page, change gallery page settings, set featured groups, define the basemaps available in the map viewer, choose application templates, and set utility services. Utility services are the web services that power specific functionality in Portal such as printing maps, locating addresses, calculating area, and routing. Portal for ArcGIS includes some default web services from ArcGIS Online for utility services, but you can optionally use your organization’s web services to enable the utility services. Portal for ArcGIS complements ArcGIS for Server because it provides an attractive front-end user experience for web services from an ArcGIS Server site. In addition, you can use ArcGIS Server web services to power Portal’s utility services such as geocoding, high-quality printing, and routing. Portal for ArcGIS can be integrated with ArcGIS for Server in three ways. In this configuration, Portal for ArcGIS and ArcGIS for Server are more closely integrated. When you federate an ArcGIS Server site with Portal, it uses Portal’s identity store. This means that all Portal for ArcGIS members are now the only valid logins to the ArcGIS Server site. The ArcGIS Server site’s identity store is no longer used. Any web services that are published to the ArcGIS Server site will automatically be available as an item in Portal, and when users try to access the item, they will have a single sign-on user experience. Portal can be federated with multiple ArcGIS Server sites. A Portal for ArcGIS instance can use one or all of these integration options with ArcGIS for Server and with multiple ArcGIS Server sites. Selecting which integration option(s) to use will depend on your organization’s business workflows. These ArcGIS client applications extend the reach of your organization’s GIS assets in Portal for ArcGIS to a broader user base.